The Disney Mickey Mouse 3-in-1 Potty System now works with the free Share the Smiles™ app to help you encourage your child during potty training! This innovative rewards system combines a colorful chart with Disney stickers and then gives them a digital twist. 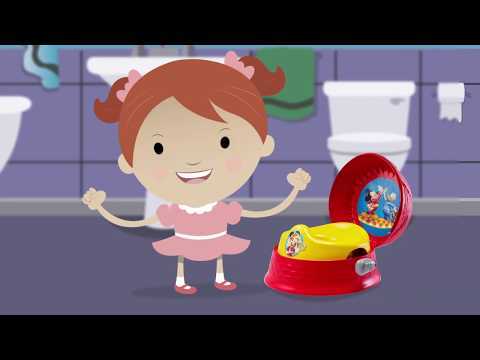 Add one of the included character stickers to the chart when your toddler uses the potty. The Disney Mickey Mouse 3-in-1 Potty System now works with the free Share the Smiles™ app to help you encourage your child during potty training! This innovative rewards system combines a colorful chart with Disney stickers and then gives them a digital twist. Add one of the included character stickers to the chart when your toddler uses the potty. Scan the character sticker with the Share the Smiles app, and a Disney friend will fill the screen with cheerful music and an encouraging message. Combined with the flush handle that delivers a rewarding sound when pushed, you can now support your toddler during the potty training process in truly creative ways. This 3-in-1 Potty System starts out as a standalone training potty. When your child is ready to move from the potty to the family toilet, the detachable ring can be used to help ease the transition. Long after your toddler has mastered potty training, they can continue to use the handy step stool that’s perfect for helping little hands reach the sink. 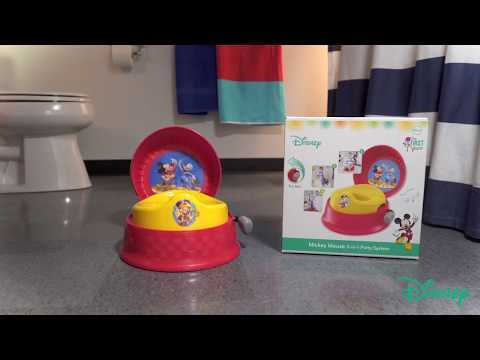 3-IN-1 POTTY SYSTEM: Compact design includes a training potty featuring Disney designs, a potty ring with splash guard for a smooth transition to the family toilet, and a helpful step stool.